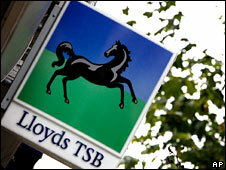 The merger of banks Lloyds TSB and HBOS has been granted the final legal approval by a court in Edinburgh. Following the decision by the Court of Session, the new Lloyds Banking Group is due to start trading from next week. The announcement came after it was revealed that the Treasury is to own 43.4% of the merged bank after few shareholders bought new shares. Only 0.24% of the new shares HBOS offered to shareholders were taken up. At Lloyds, only 0.5% were purchased. The newly named Lloyds Banking Group will control about 25% of British customers' personal bank accounts and about 28% of the mortgage market. "We are pleased that the capital-raising process has completed and that the new, combined group will have a strong financial position," said Lloyds TSB chief executive Eric Daniels said. The government pledged to underwrite both banks' rights issues as part of its £37bn rescue of the UK banking system in October last year. Both banks have found it tough to raise capital given continuing uncertainty in world financial markets. The government stepped in last year in a bid to prevent further turmoil in the financial system as it became clear that HBOS was in difficulty. While the size of the new firm would usually have triggered competition worries, the government waived such concerns arguing that the deal would help maintain the stability of the banking sector. But there have been worries that the bank could limit choice for consumers. At the end of 2008, the Office of Fair Trading said there could be a "substantial lessening of competition" in personal current accounts, bank services for smaller firms, and the mortgage market as a result of the transaction. The government has also intervened and taken a majority stake in Royal Bank of Scotland in a bid to improve its fortunes.